Protect your iPad Pro and look even more professional. Highlights: Olixar is a reasonably priced maker of rugged cases for smartphones and tablets. The ArmourDillo is no exception, sporting two layers that mesh together to protect your new iPad from drops. A kickstand also opens off the back to prop up the iPad. Unfortunately, Olixar is currently only offering the ArmourDillo for the 12.9-inch iPad and not the 11-inch version. 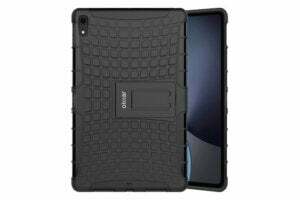 You can buy the Olixar ArmourDillo for the 12.9-inch iPad Pro from MobileFun for $14.49 plus $2.99 for economy shipping. Highlights: Speck’s Presidio Pro line is already available for both of the new iPads. These cases promise up to 6 feet of drop protection and safeguard the iPad Pro from all angles. Speck’s Presidio Pro cases have a smooth look and feel, and even a cradle to hold an Apple Pencil. Its cover opens and closes via a clasp and also doubles as a kickstand. 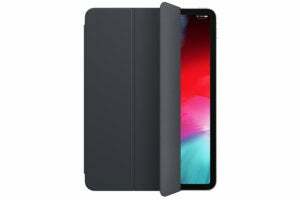 The Presidio Pro is available from Speck’s website at $59.95 for the 11-inch iPad and $89.95 for the 12.9-inch, including free shipping and returns in the United States. Highlights: For nearly a decade, Pad & Quill has been making excellent leather goods for electronics. 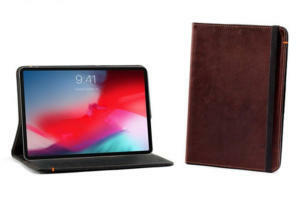 The company refitted its Oxford Leather Case for the new iPad Pros, with all the same durability and class as the old versions. Made from a single piece of leather, the Oxford sports an interior pocket for documents, a self-propping stand, and fits the Apple Pencil and the Smart Keyboard Folio. It’s perfect if you’re a business person or professional student. Pad & Quill provides an impressive 25-year warranty and includes shipping and returns in the United States. Highlights: This sleeve case from Tomtoc is perfect for an iPad Pro owner on the go. And at under $50, it doesn’t look or feel cheap at all. 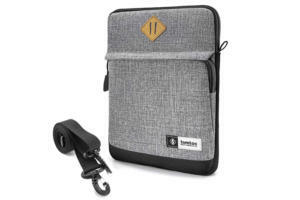 The Shoulder Bag Sleeve has a wide range of perks, including an Apple pencil holder, an outside pocket for stuffing accessories and cords, and enough room for an iPad Pro equipped with the Smart Folio Keyboard. But its best feature is how it can be carried. 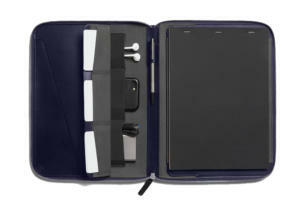 Not only does the case have a shoulder strap, but it also has a stretchy, reinforced handle on its side. Unfortunately, the case is only good for holding the 10.5-inch and 11-inch iPad models. Tomtoc’s Shoulder Bag Sleeve is available from Amazon for $21.99 instead of the regular retail price of $40.99. Highlights: Bellroy’s sleek work folio isn’t specially designed for the new iPad Pros, but it can still carry the 11-inch and 12.9-inch models with ease. If you’re looking for something to hold your iPad Pro, documents, notepad, cords, and other small electronics, the Work Folio A4 is an appealing option. To give you an idea of the folio’s size, Bellroy says it can “tightly fit” a 13-inch MacBook Pro or 12.9-inch iPad Pro along with other essentials. Although it’s not cheap at $300, Bellroy makes exceptional modern leather products crafted from sustainable materials and “gold-rated” environmental protocols. The Work Folio A4 is backed by Bellroy’s 3-year warranty and the company includes shipping to the United States. Highlights: If you want to stay close to home so to speak, Apple sells its own line of protective gear. 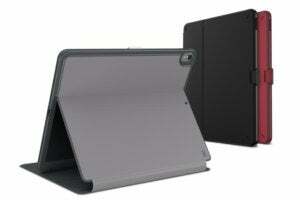 Apple’s Smart Folio folding cover has been a constant companion of the iPads since they launched back in 2010. While the cover can really only protect the screen at best, it’s remarkably light and intuitively designed. Notably, the cover folds into a triangle at the back of the iPad to double as a kickstand.